In this tutorial, we are going to learn more about what is GitHub, how it works and how to use it to save your code online. GitHub is an online hosting service which is basically used to store your code on cloud with all the changes ever happened during its development. GitHub makes use of Git; but while Git is just a command line tool, GitHub is more of a Graphical Based web service. It is also known as a Social Networking site for developers because it facilitates Social code building between developers while working on a common project. Open up github.com and create a new free account. Then, in the upper right-hand corner, click on the + sign and select for a New Repository. Set up a suitable Repository name. Leave the “Initialize this repository with a README” option unchecked. Set the “Add .gitignore” option as None if you have set it already using command line; otherwise set the desired option according to your Project. Further, leave the License as None. 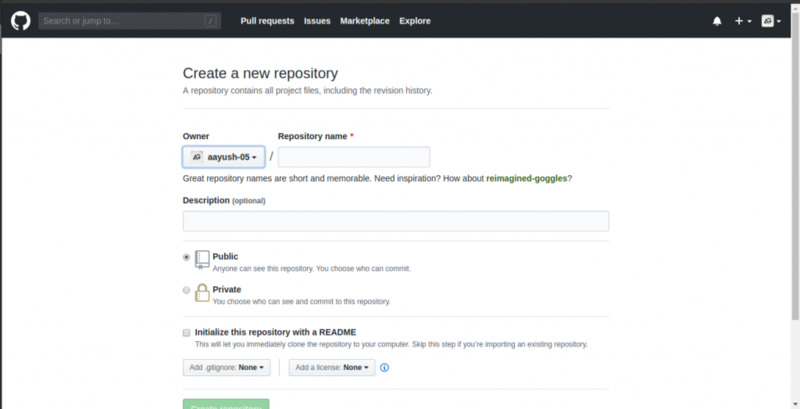 Now, we need to attach your Git Repository to one on GitHub. After this you will be asked for your GitHub credentials; enter them and if everything went fine, you will see something like this. Writing objects: 100% (16/16), 23700 bytes | 0 bytes/s, done. Hurray! Your code is now saved on GitHub. Feel free to drop any doubts/queries in the comment section below.